For our 17th Dubplate feature, we have DR.QUAKE [Ameya Bhanushali], who is a 21year old Drum and Bass DJ/Producer from Mumbai. Ameya, puts together very unique and melodic Drum and Bass sounds, which one doesn't come across very often. Knowing this young talent for a while now, we cannot think of any other adorable personality we've come across, like his. Juggling with college and music, he has bigger dreams and things on his list. Read more to find out, and do not forget to support by listening to the exclusive set, and sharing it with like-minded. A : Well being a bass guy I wanted something related to bass music and my mentor DJ Reji told me Quake like the Earthquake, haha! The Doctor part was later on, when I was listening to music and I stumbled upon this hard style guy called Dr.Rude and a trap guy called Dr. Uzi or something, I can't really recollect, so I thought if I should add Dr. in front of my name too. So that's how Dr.Quake happened. A: Well I was into Dub before Drum&Bass. I got to know about Dubstep first and then later came to know about Drum&Bass. I'm 21 now and I think I discovered bass when I was like 17 or 18. Also, I was pretty new to the scene 3-4 years ago. But I explored a lot and that's how I stumbled upon DnB. Although, I don't remember the name of the first DnB song I ever heard. Skream and Benga at Mumbai was my first ever Bass music gig. Liquid DnB happened when I started exploring DnB even further, it's sub genres and different styles! And being an upcoming DnB guy, I very often got an opportunity to do an opening set for a couple of DnB artists and I would play Liquid DnB to start the night off. So after playing Liquid DnB almost every time I fell in love with it, and that's usually what I play now entirely, even if I'm closing the night. 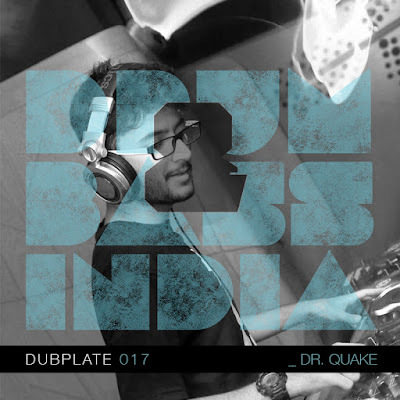 A: The bass scene, I feel has taken a step back in the past two years, I rarely see any big names in Drum&Bass touring India now. The amount of clubs supporting Drum&Bass is really low! House and commercial gigs are happening like crazy while bass music is being left behind. I feel the bass music scene is nowhere near its potential, and that it'll take a couple of years till we can see the likes of Noisia, Andy C, Friction touring, although I hope it happens really soon! There are few nights supporting Drum&Bass and I just hope the number of DnB gigs keep on increasing and people start coming out and dancing to something other than your commercial music. The way the scene has evolved has been crazy but we’re not taking it forward! There are very few producers dishing out DnB tunes and making an impact on the DnB scene! But I just hope that this scene grows bigger over time. 4. Given that you’re still in college, it must get difficult to juggle between music and books. Tell us a little about how you manage your time. A: All my musical exploration usually happens during travelling and on the weekends, weekdays are all about college. It does get really difficult and you always have to compromise on something or the other, but it's fun nonetheless. All of my music and sets and production plans are set for the days I do not have any college related tasks. 5. What are your music related plans after you finish college? A: Well after my engineering I plan to do my MBA in Music Business at Berkley. I really want to understand the industry from the business point of view and wanna work in this music industry. I do not intend on stopping to play or produce bass music though. 6. What’s coming up next? Working on some music that we should look forward to? A: I've got two Liquid DnB tracks in the making. Hopefully I should release at least one of them by the year end. 7. What according to you are the pros and cons of being a Bass artist in a country that is still coming to terms with this genre? A: Well being a bass artist you're sure to get quality gigs, all the artists I've played alongside are biggies in their scene and you get to play what you love and not what the crowd wants. You can easily stand out in the current scene by being a bass artist and you can easily get spotted by promoters if you're playing anything other than the commercial stuff. The cons however are there too, the amount of gigs you're gonna get is gonna be really less unless you're like the biggest bass artist in India. You won't earn much compared to a house or an commercial DJ and you can forget about being booked every weekend. If you're in it for money then there's no use being a bass artist. The clubs and venues are also less supportive of the bass scene now! The only time I'm really happy with the bass scene is during the Arms&House stage at the VH1 Supersonic festival and Bass camp festival. A : I'm juggling between the usual CDJ 2000 nexus, DJM 900 mixer and Novation Launchpad, LaunchControl. For the launchpad I use the Pioneer Rekordbox DJ with my own mappings on the Launchpad and LaunchControl. For studio I'm using both ableton and Logic Pro along with a Scarlett 2i4 as a soundcard. My sets are usually live with no prior track list but I sort them out via their Keys, I always do harmonic mixing, I haven't played a single set where I haven't done harmonic mixing. A: Open my eyes- Pola&Bryson. Where did you go- Mohican Sun. Take it in - Feint. A : Best gig so far has to be my closing set at BlueFrog Pune, after Hang Massive. Everything was perfect and the crowd totally loved Liquid DnB. The crowd loved it so much that Blue frog increased my set time by an hour and I did not have enough tunes on me so I had to transfer songs from my laptop to my other pen drive while I was playing. Everybody loved the set and the number of good comments on the set were endless. A: So I finished my set and my last tune was an Arabic DnB tune and it apparently had verses from the Quran. I wasn't aware of the same, and so when I played it and was about the leave the stage, a guy came up and threatened me and the DJ who was going to play after me, to stop the music and end that tune right now. Luckily there were bouncers, haha! A: That's a tough one, I think I'd end my last gig ever with either ‘Come Alive - Netsky’ or ‘We won't be Alone - Feint’.